We have had a great deal of involvement in this site over the past couple of years, and we are pleased to see building works now progressing accordingly. We were originally appointed to provide Architectural Services at the end of 2010, in respect of a single 3 bedroom dwelling on this site which was granted planning permission however, after careful consideration, our client asked us to explore the possibility of constructing a pair of semi-detached houses on the site. 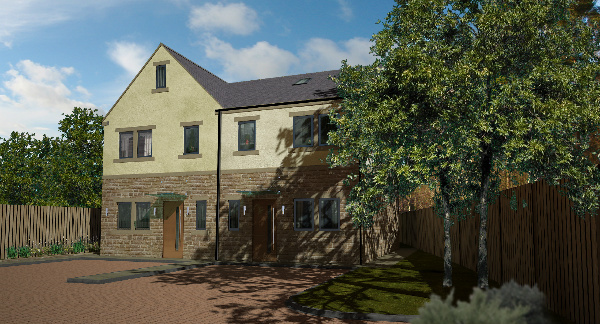 The planning application we produced and submitted to Bradford Council was certainly not straight forward, as the site was restricted, with the added complication of a fresh watercourse running through the middle of it. A detailed engineering solution and flood risk assessment was required in view of the necessary diversion of the watercourse, in order to convince the local planning authority that the proposals were suitable, and after a lengthy application, during which a great deal of additional information was provided, planning consent was finally granted by Bradford MDC earlier this year. Architecturally, the new dwellings take on a fairly traditional form however, a number of contemporary details, such as gun-metal grey aluminium windows, glass canopies and cutting-edge composite doors with feature stainless steel pull-handles help to provide a modern twist. The internal accommodation is planned over three floors, again with some contemporary additions in the form of high-gloss kitchens, sliding doors, and Juliet balconies with glass balustrading overlooking the private rear gardens.